This is a Chinese name; the family name is Leung. 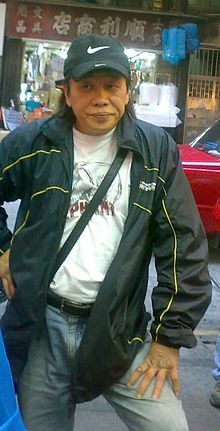 Leung Siu-lung, born in 1948 in Hong Kong, is an actor who has appeared in many Hong Kong martial arts movies. He often appeared billed as "Bruce Leung", "Bruce Liang", "Bruce Leong", or "Bruce Leung Siu-lung", and is thus generally grouped among the Bruce Lee clones that sprang up after Lee's death in the subgenre known as Bruceploitation. Leung learned martial arts from his father at the Cantonese opera. While his major style is Goju ryu Karate, he also is a Wing Chun practitioner. Throughout the 1970s and 1980s, he appeared in a large number of martial arts films. Most familiar to Western audiences may be Jim Kelly's The Tattoo Connection (in which he only appeared briefly, but choreographed the action sequences) and Jackie Chan's Magnificent Bodyguards, which was the first Hong Kong film shot in 3D. He is also known for playing Bruce Lee in the notorious Bruceploitation classic, The Dragon Lives Again. In addition, Leung appeared in his own star vehicles, including My Kung-Fu 12 Kicks, Kung Fu: The Invisible Fist, and Black Belt Karate. Leung retired from acting after 1988's Ghost Hospital. However, in 2004, he made a return to the screen as The Beast in Stephen Chow's Kung Fu Hustle (which, incidentally, was his first villainous role). In 2007 he appeared as himself in Italian documentary Dragonland directed by Lorenzo De Luca. The interview was made by night on the set of Shamo. This page was last edited on 1 February 2019, at 21:28 (UTC).